Click the picture below to download the current Golden Elixir Press catalogue (PDF). 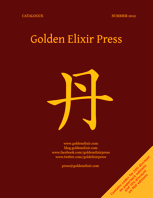 The catalogue contains codes for discounts on PDF editions of Golden Elixir books. See the last page of the catalogue for details. To receive announcements of future catalogues by email, please use the contact form.